Successfully Added IP Camera (PTZ + Motion Detect + Audio) to your Shopping Cart. IP Camera with Pan Tilt Zoom (PTZ), motion detection, and even records audio on top of great quality video...not only can you on people, now you can on people from anywhere in the world! If James Bond were a wizard class hacker he'd totally use the i52 IP Camera for all his surveillance needs. 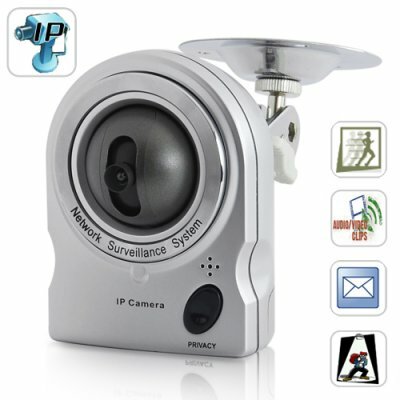 Place this ip camera anywhere in your room - hidden between the teddy bears on the shelf or between your CD collection. Then use the Pan Tilt Zoom function to see everything the camera sees! The I52 IP Camera lets you view, stream, and even record from another room, another building, or even another country because it works with your computer's networking system to support LAN, Intranet, and even Internet monitoring. But there's more. To extend the power of this amazing IP Camera we gave it motion detection functionality and email alerts. The benefit to you - if something moves, the IP Camera detects it and instantly notifies you by email. Awesome huh? This amazing product comes with our famous Chinavasion 12-month satisfaction warranty and is available with a factory-direct China Wholesale Price that you cannot find anywhere else. 30 frames per second video! Setup is really easy. Plug the IP camera into a power outlet. Connect your Ethernet cable to the IP camera. Install the software. The program generates an IP address. Paste that IP address into your Internet Explorer and instantly view or record this camera's streamed videos. That's all! Great alternative to a baby monitor! After you install the software, run it to get the IP address of your camera. Fire up your browser and enter the IP address. You'll see what the camera sees as well as settings to enable motion detection and email alerts. You'll need the email address you want the alerts sent to as well as the smtp information. For example, if you're configuring gmail it would smtp.google.com, you're done. When there is motion detected you'll receive an email alert with a snapshot of the camera saw. Is this the IP Security Camera (Angle Control + Motion Detection + Audio) that I've seen on your site before? This is the improved IP Camera version!